The VIMET duplex is a bright, attractive and contemporary style 2-storey and 3-bedrooms apartment. The decor is both chic and comfortable. The access to the apartment is through the street level of the building. 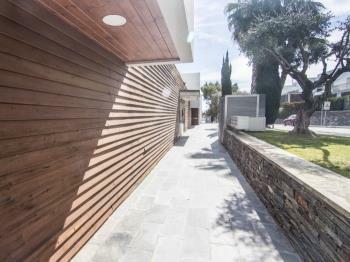 The entrance opens into a hallway leading to a stylish and bright open-plan living room/dining area that has large doors onto an impressive wooden decked L-shaped terrace with views over the complex and out to sea. The terrace is equipped with outdoor furniture for al fresco eating and enjoys views to the Mediterranean and the surrounding Colls de Miralpeix Natural Park. This is the perfect spot to unwind and relax after a stressing sightseeing day. 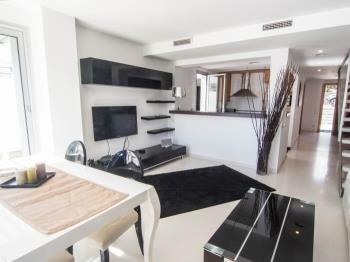 The living room is tastefully furnished with a large sofa, TV and coffee table. 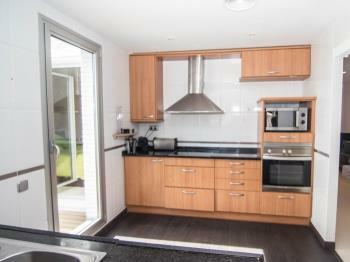 The dining area has a dining table that comfortably seats 4 guests and is conveniently situated next to the kitchen. 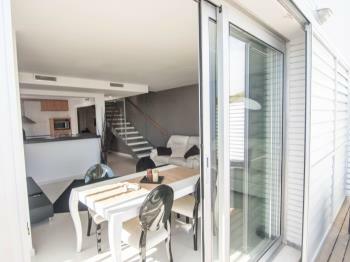 The kitchen, partially open to the lounge area through a large window, is modern and fully equipped with 4-ring electric hob, built-in oven, microwave, a small fridge, dishwasher, coffee machine and toaster. On the ground floor there is also a master bedroom with a double bed, a large built-in closet and a full bathroom (with bathtub) ensuited. 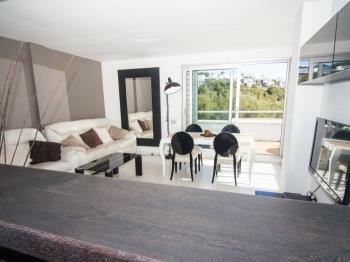 The guest has direct access from this bedroom to a portion of the main terrace, also accessible from the lounge area. A flight of stairs leads to the upper level of the duplex where our guests will find two bedrooms and a full equipped bathroom with bathtub. 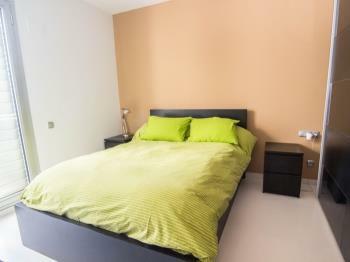 The bigger bedroom has a double bed, a bedside table and a chest of drawers with a flat screen TV. 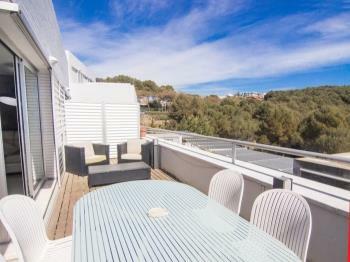 It has direct access to a smaller terrace with even better views than the main outdoor area downstairs. 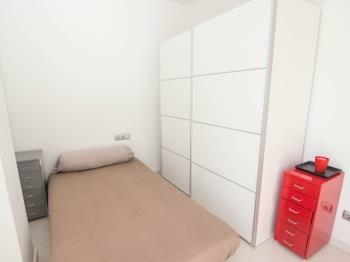 The second bedroom has a single bed, bedside table with drawers and a large wardrobe. 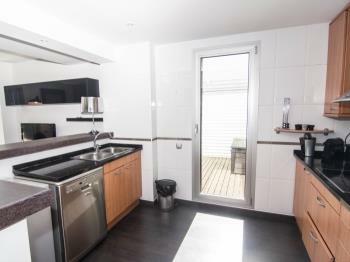 Furthermore, there is a utility room on this level with the washing machine and an extra fridge/freezer. The VIMET apartment offers adsl free internet access for our guest’s convenience. 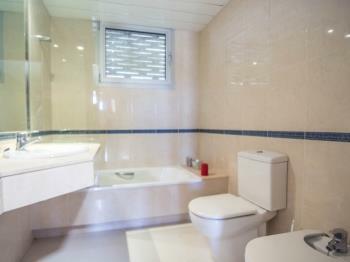 The property is fully air conditioned and it also offers central heating for out of season holidays if required. 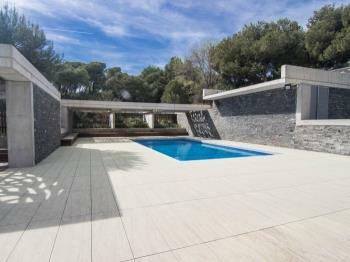 The community area features a large main infinity swimming pool and an additional smaller pool, ideal for younger kids. 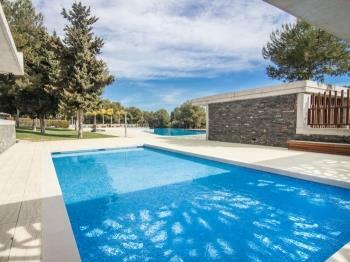 The attractive and spacious gardens surrounding the pool area are very well maintained and provide the perfect space for sunbathing and relaxing by the pool while the children enjoy themselves. 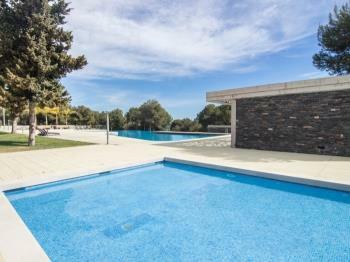 All pools are available to swim from June to September, both included. 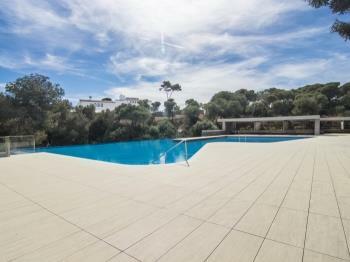 If you plan to visit us outside this period of time and having access to a pool is a must for you, please, contact us before confirming your booking to double check that the pool of your choice is ready to be used. Some pools are closed during the cooler months for maintenance works. 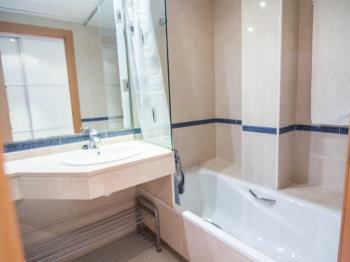 There are sunbeds for guest use and also a changing room with toilets and showers for additional guest convenience. 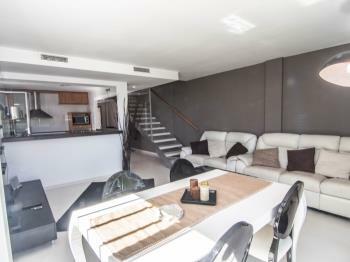 All in all, the VIMET apartment is the perfect choice for our most demanding guests searching for a quiet and upscale accommodation, with all the mod cons, and also close to all the action that Sitges, Vilanova and the vibrant city of Barcelona have to offer. 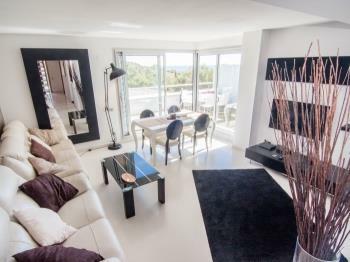 The VIMET duplex is a beautiful designer apartment, close to the sea and located within an exclusive private complex with access to the most impressive communal swimming pool and garden in the area. 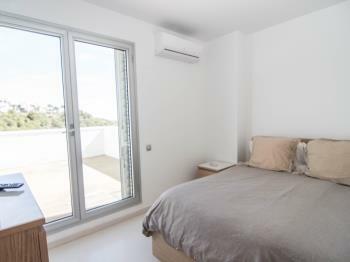 The apartment is about ten minutes’ walk from the sea, where our guests will find low rocky cliffs and small coves for swimming. El Far large sandy beach in Vilanova, offering all the usual services (bar, showers, sun loungers and umbrella rentals, etc…) is only a 15-minute walk. 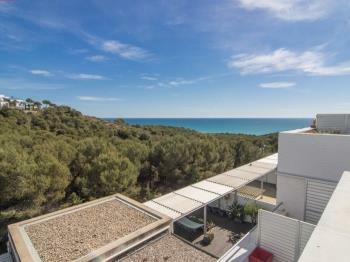 The Casas del Mar complex where the VIMET apartment is located has been designed by prize winning architects and is located on a hill overlooking the Mediterranean Sea, between Sitges and Vilanova. The development has been built to the highest standards and offers 24 hour private security. Despite its quiet location, Casas del Mar is an easy 5-minute drive to the bustling seaside resorts of Sitges and Vilanova i la Geltrú, with an abundance of boutiques, cafes, bars, restaurants and, of course, the world famous golden sandy beaches. The cosmopolitan city of Barcelona is just 40 minutes away by car or train. 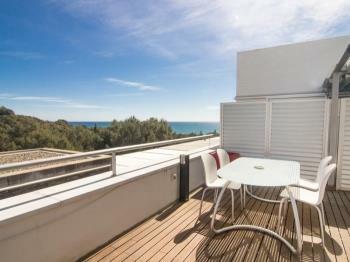 Our guests can walk to Vilanova town centre from Casas del Mar along the beautiful coast path. It is also possible to walk to Sitges through Els Colls de Miralpeix Park, but the terrain and distance makes it more demanding. We recommend all guests at the VIMET apartment to have their own vehicle while staying in the property to better move around the area. 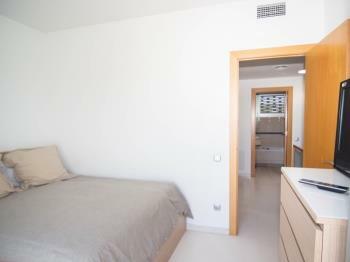 Despite it´s easy and safe to park in the surroundings, the apartment offers a dedicated parking space in the basement of the building for our guest’s convenience.